I personally found interest in kendo during my undergraduate years when I felt like a lost pebble, being tossed around in a rushing river. I wanted to be part of something bigger. As my mind was expanding with my progression in school, my soul was seeking for that advancement too. 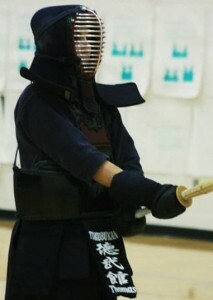 Looking at the catalogue of intramural sports, kendo was the last sport to round out the list. Having no idea what this “Kendo” was, I looked it up. With my good friend, Wikipedia, at my side I was granted a glimpse into the kendo world. For me, kendo was an intrigue, not from the physicality of the art, but from the philosophical practices that are enforced before, during, and after practice. This also parallels the before, during, and after components of datotsu, a perfect strike. After the repetition of these concepts, they become part of your character in and out of the dojo. What struck as the most encapsulating was the concept of haragei. From my understanding, haragei is roughly translated as “belly wisdom” or more deeply, “one’s gut intuition.” In the Western world, it is often said to “Go with your gut,” and yes, we may follow this adage as a means to follow an internal push aside from the calculations of the mind. But with kendo, this “go with your gut” urge takes a level deeper. Going with your gut encompasses instinctual perception, patient reaction, and acute and calm attentiveness. Concepts that sound contradictory are the ones I find myself honing over until one day, I see it, I do it, I am it, and I get it! Harnessing your internal power, whatever that power may be, gives you something that no one else has. It is your own core wisdom, your own way of cunning, and your own perception and enactment of intuition. When we can hone in on our own depth of intuitive control, we may have moments of “blacking out” and performing an action in a space of numbness. We are then surprised that we may have gotten an ippon, or executed a strike in a most perfect way. This is how kendo, to me, is so beautiful in its balance. No one is the same, so one person, at any level, may have something another does not, and everyone can get ippon. I also wonder if this is how higher-level Senseis feel during all of their practices, jigeikos, and shiais? Is this what samurai aimed to attain during battles? To completely rely on your human internal instinct and fight with something along with, or aside from your brain only? This is something I aim to understand more completely.